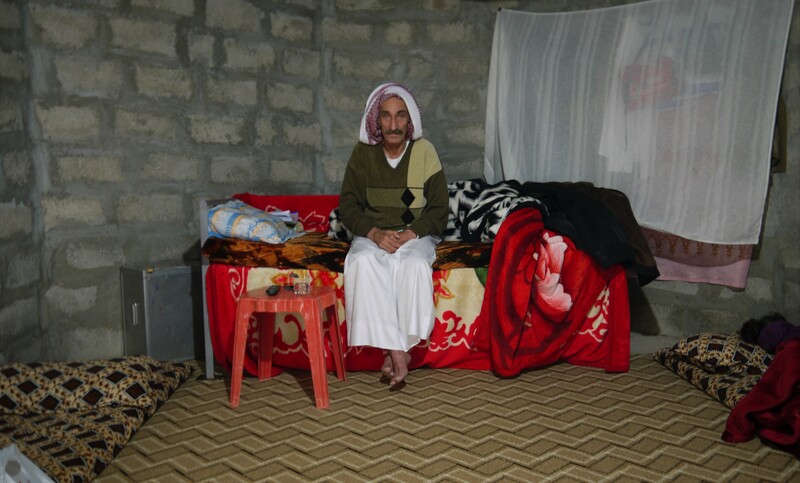 Shamo Hassan is a 63-year-old Yazidi man from Douguri, in the Sinjar region of North-Western Iraq. In August of 2014, he and his family were forced to flee their home when ISIS began the violent persecution of the Yazidi people. At the time, his son had a car which allowed to make a quick escape into Kurdistan. He now lives his wife and four daughters in a caravan in Khanke IDP camp. Two of his sons married and remain in the camp, while his third and youngest teenage son is studying in Germany. Last year, Shamo suffered a subarachnoid brain haemorrhage. Besides chronic medication, Shamo had to undergo a complex and expensive surgical procedure to correct the damage done. This surgery, offered only by foreign doctors who occasionally travel to Iraq to carry out such procedures, set him and his family back 15000$. The family had to borrow much of the money and are now indebted to their friends and neighbours. The rest, his daughters made by working sporadic shifts over the summer holidays, in between their studies. Unfortunately, the surgeon was unable to complete the surgery as it was deemed to dangerous. So, Shamo will have to undergo a second procedure in a matter of months. This means he will have to find money once again to cover the costs of the procedure. We would like to help Shamo as much as possible. Any donation towards his surgery is much appreciated, and a great relief on the family.